Dr. Hassink is a pediatrician and director of the Nemours Obesity Initiative. She is chair of the Obesity Work Group of the American Academy of Pediatrics and a member of the AAP Board of Directors. What impact does obesity have on children's health? What advice do you give families dealing with obesity? Can you explain what 5210 stands for? If a parent is concerned about their child's weight, what should they do? What is the AAP's partnership with Let's Move? Dr. Bhatia is chair of the Committee on Nutrition of the American Academy of Pediatrics and chief, Division of Neonatology at the Medical College of Georgia in Augusta. What benefits does breast feeding give to a baby? 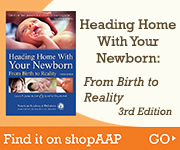 How can parents choose the best formula? When is the best time to start solid foods? What are good foods to start with? What foods should you avoid giving to a baby? How important are omega-3 fatty acids for kids? 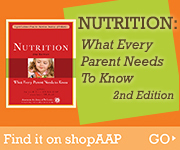 How can vegetarian families ensure children get the nutrients they need? How can parents set their kids up for a lifetime of healthy eating? Dr. Shifrin is a pediatrician in Seattle, Wash., and served on the AAP Obesity Task Force. The following audio clips were recorded for the “A Minute for Kids” radio feature.